Cleveland Browns quarterback Baker Mayfield throws a pass in the first half of an NFL football game against the Baltimore Ravens at M&T Bank Stadium in Baltimore on Dec. 30, 2018. 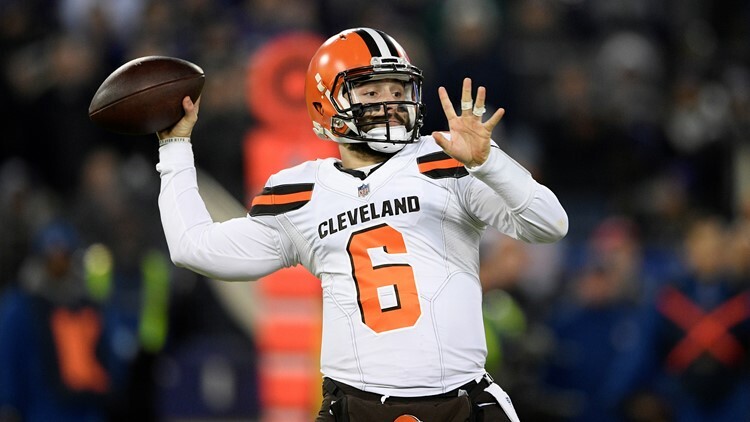 CLEVELAND — CLEVELAND -- Cleveland Browns quarterback Baker Mayfield has drawn plenty of rave reviews for his play in his rookie season, and that group grew a little larger on Friday. “Normally, a guy like Mayfield would probably be in Tier 3 after less than a season under center, but he won, regularly, with a Browns team that had not won anything for like two years, and he did it despite Hue Jackson still being the head coach at the time. Mayfield broke the NFL rookie record with his 27th touchdown throw of the season with 3:24 remaining in the fourth quarter of a 26-24 loss to the Baltimore Ravens in an AFC North Division clash at M&T Bank Stadium in Baltimore on December 30. But Mayfield is “absolutely not satisfied by how last year ended by any means” and has loftier goals than one rookie record, especially after the Browns acquired Pro Bowl-caliber wide receiver Odell Beckham Jr. in a trade with the New York Giants last month. 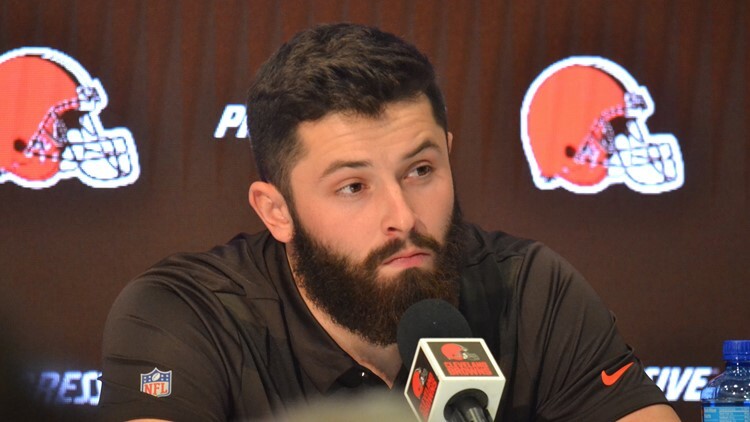 Cleveland Browns quarterback Baker Mayfield listens to a question during a press conference to kickoff the offseason program. 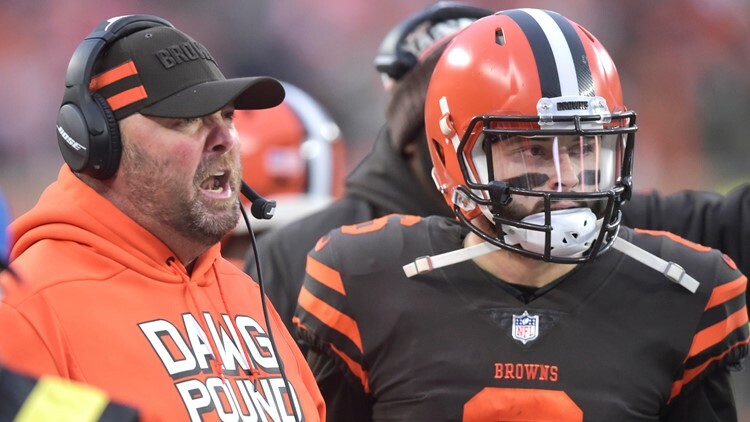 Under new coach Freddie Kitchens, the Browns’ interim offensive coordinator for the second half of the 2018 season, Mayfield completed 180 of his 263 attempts (68.4 percent) for 2,254 yards and 19 touchdowns against eight interceptions. Mayfield guided the Browns to seven wins and the greatest single-year turnaround in franchise history. Although Mayfield does not get official credit for the victory over the Jets because he came on in relief of an injured Tyrod Taylor, the first-year quarterback guided the Browns to seven wins and the greatest single-year turnaround in franchise history. 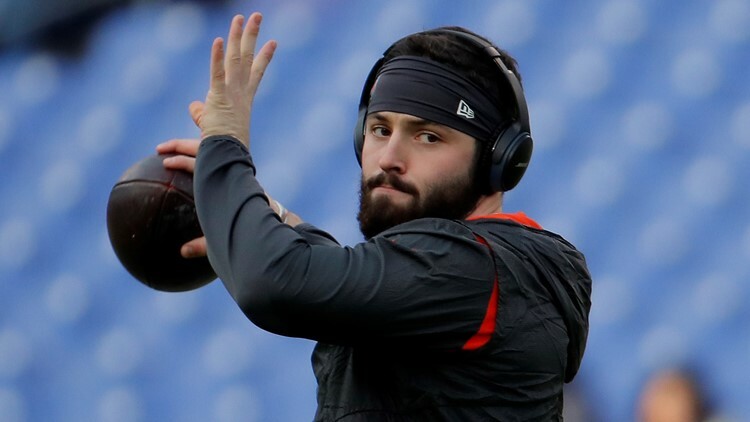 Individually, Mayfield set franchise records for the most passing touchdowns and yards by a rookie, and his 3,725 yards rank as the sixth-best single-season total in team history, regardless of years of service, as well as the fourth-most accurate season of any Browns quarterback ever. In addition to being named the Rookie of the Year from the Pro Football Writers of America, Mayfield won the fan vote for the Pepsi Rookie of the Week seven times, was the NFL’s Rookie of the Month for November and earned AFC Offensive Player of the Week honors after leading the Browns to their first season sweep of the Cincinnati Bengals since 2002. Also, Mayfield was selected as the Offensive Rookie of the Year by ProFootballTalk.com.